When we were looking forward to and contemplating what the year 2000 could possibly bring, we were convinced that many space-age concepts would come to life and some even thought we’d be living on the moon by now. While we still have some very lofty ideas regarding the future, such things aren’t so far-fetched in the rapidly changing hotel industry. The hotel industry, after all, is constantly looking for the next best thing and always trying to satiate its guests’ desire for more technology and more innovative concepts. Some hotels take “modern” to the extreme and use sleek styles to create an out-of-this world feel. Others have used technology to create a truly customized experience for guests. The SerranoBrothers Design Studio of Spain has created a hotel room that emphasizes user interactivity and flexibility of decor and space. 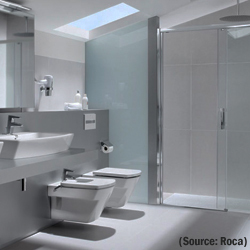 The design uses Microsoft Surface Table, Roca’s avant-garde W+W toilet and sink along with a Roca radio mirror to create a customizable experience for a guest’s every mood. While the implementation for every room on the property may be out of the price range, it is a huge step toward showing that such a design is possible. Hotel chains like Marriott use guest feedback to refine their future designs, and they use focus groups to co-create a design that works on both ends. Outside of the lab, Marriott also promotes its Travel Brilliantly campaign. It asks savvy travelers for suggestions on everything from design and technology to food and beverages. Whether it is immediately outwardly visible or something more discrete, hotels are changing. They are quickly morphing into the hotels of the future. So, find out what your guests are looking for and move from there. You don’t have to completely revamp your property to stay on track, as a few updates here and there will keep you on par with those taking the large-scale overhaul approach. Easing guests into the change may be a more sustainable approach, after all. For more informative content on the latest trends in hospitality technology, visit our exhaustive resource section. To know more, be sure to participate in the webinar organized by Hotelogix on the 3rd of September on “The New Rules for UK Hotels”. "The Hotel Room of the Future", 5 out of 5 based on 1 ratings.